Have a corner that needs a little pick me up? What about a table or dresser that needs some pizaz. 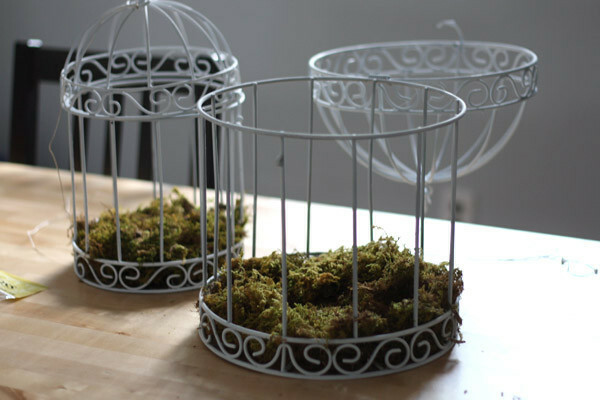 Well, my birdcage project is an easy and cute way to brighten up an room and give it some style. Remember, hanging things on the wall is not the only way to take up space. A home shouldn’t feel like a museum or gallery. It should reflect who you are and exude life, comfort and creativity. I have always loved birdcages. Especially ones that had vintage appeal. Maybe it was all the birds I had growing up. 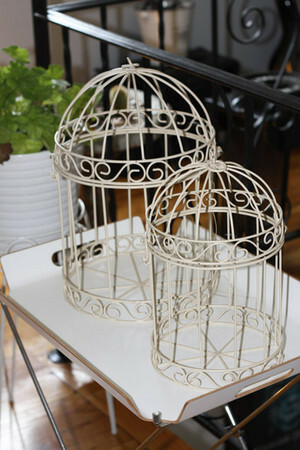 Whatever the reason, birdcages are really beautiful things. Not only do they fill space in a smart way but they allow the space to still feel spacious because of their cage like exterior. They could be pretty pricey so finding one that is easy on the wallet but still packs in style may be a challenge. However, there are so many different kinds and due to popularity, they are sold in many shops. Just be on the lookout and you will find one in no time. The set of birdcages I used for this project were actually found at a garage sale. Reusing and recycling is the best way to shop. Just because someone is getting rid of something doesn’t mean its garbage. Check out the yard sales in your neighborhood and I promise you will find the unexpected. I came across this set for $6 and I couldn’t walk away empty handed. 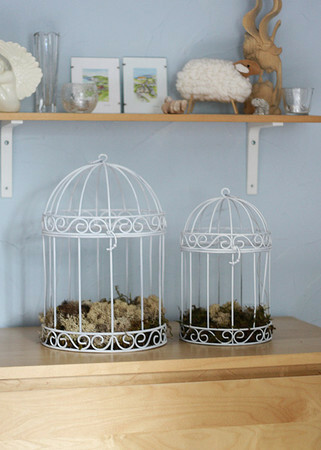 If you decide to buy a birdcage from a store, that’s fine too. 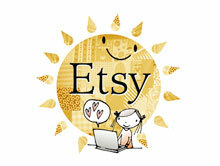 Check out antique shops and don’t forget about Etsy and Ebay. The fun is in the hunt, so get your comfy clothes on, gather up some loot and get ready to shop. Once you have your birdcage(s) you are ready to begin. Now, if you like it just the way it is than fine. But if you need to make some changes – let’s begin. The set I bought were an ivory color but I wanted them to be white and have a shabby chic feel. This is how I did it. First, I bought white spray paint and changed the color. I would recommend you use Rust-oleum. Make sure you do this step outside and wear a mask if you have to. You don’t want to breathe this stuff in. Once you’ve waited about 10 minutes or so, the cages should be dry and you can move on the next step. Now, you can really get creative here so don’t hold back. 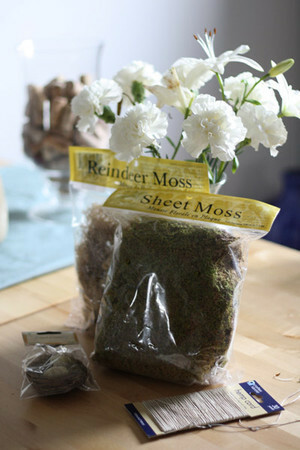 I chose to add some reindeer and sheet moss instead of real moss. But you can certainly use it if you want to. I think it would look really cool too. 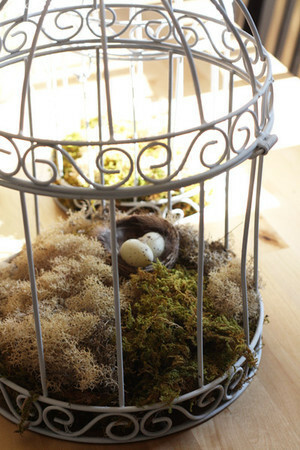 I also picked up a small bird’s nest with robins eggs to place inside. I thought it would look really cute and add a nice touch. Plus, for $.99 why not, right? So far this project is costing me $14! Not bad. 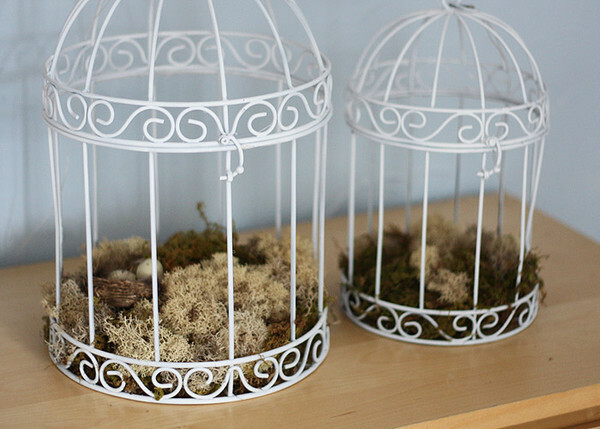 If you don’t want to use a moss-like feature than try flowers or even air plants. Once you have this step complete you are pretty much done. If you are going to hang them up you can either use ribbon or string. I actually prefer hemp cord because its strong and looks natural. Plus, it’s really cheap and you can hardly see it when the cages are hung. If you don’t want to hang yours than just make sure you place it with other items so it doesn’t look all alone. If you have a set like I do, keep them together. I hope you enjoyed this project and can be proud of what you created. Just because something is not exactly how you like it doesn’t mean it can’t be yours. All you have to do is use your DIY powers and you can turn it into something you love.